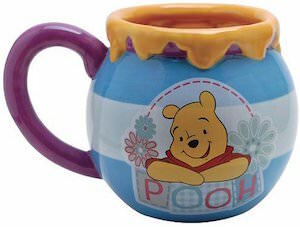 Now there is a Winnie the Pooh mug that not just has Pooh bear on it but also looks like a honey pot. Hmmm Pooh loves some honey and that is why this mug is so perfect as it looks like a pot of honey that is over flowing of the good stuff. On the mug you can also find an image of Winnie and he looks really happy. The 18 oz. ceramic mug is 4.25 inch tall and is just one of those mugs a true fan of Winnie the Pooh needs to own. Who go for average when you can have a honey pot mug from Winnie the Pooh? Do you need to hide some cookies? Hide them from yourself or from others? You can keep the cookies in this awesome cookie jar shaped like Gandalf the Grey from the hit movie The Lord of the Rings. 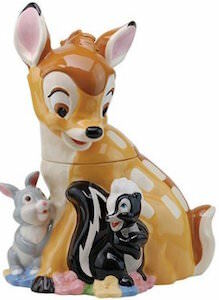 This 11.25” tall cookie jar is made of high quality ceramic and painted in full color. The leader of Fellowship of the Ring and the army of the West is seen in his grey clothes and hat, grey beard with the hilt of his sword his brown staff. The name of the movie “The Lord of the Rings” is printed on the front of the base. This officially licenced Gandalf the Grey cookie jar is an amazing decorative piece to add to your collection. 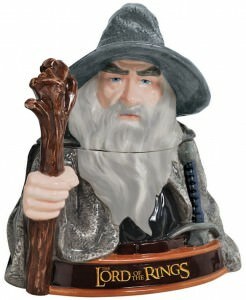 Take a closer look at this Lord of the Rings Gandalf the Grey Cookie Jar. The Nightmare Before Christmas fans will love this amazing looking pumpkin teapot by Westland Giftware. The teapot is a big orange pumpkin with on it the text “Nightmare Before Christmas” and the lid of the teapot is hold by Jack Skellington and the handle of the teapot is Sally. And to make the teapot complete the spout is Zero the ghost dog. 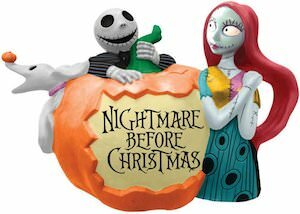 The The Nightmare Before Christmas teapot has a 35oz capacity and will be fun for Halloween and Christmas. Why keep using the same teapot year round when you can have a special Jack Skellington teapot like this one. Come take a closer look at this The Nightmare Before Christmas Pumpkin Teapot. 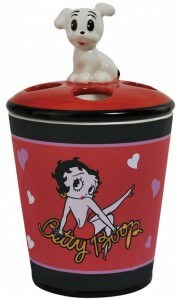 Adding to your Betty Boop bathroom set, or starting a Boop themed barhroom this is a must have. This toothbrush holder has a painted on image of Betty Boop with her leg up, a classic pose she has been seen in many times. Also find white and pink hearts all over with a red background, the awesome feature is Betty Boop’s furry dog friend Pudgy is found on top carved 3d out of ceramic. Made from ceramic this Betty Boop toothbrush holder stands 6.5 inches tall and holds up to four toothbruhses. Add this to your Boop! collection get this Betty Boop Pudgy Toothbrush Holder. Peanuts Gang fans and definetly Pigpen fans this is a perfect collectors item and a great item to actually use and add to a Peanuts themed bathhroom. Featured on this toothbrush holder is a painted image of fun characters from the Peanuts Gang like Charlie Brown, Snoopy, Woodstock and many more, On the top of this Peanuts toothbrush holder there is a 3d ceramic statue of Pigpen. This is an officially licensed Peanuts product that is made from ceramic and measures 6.5 inches tall and is a four hole toothbrush holder. 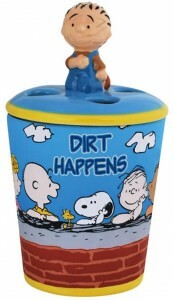 Dont miss out collect and use this Peanuts Pigpen Toothbrush Holder. Cookies need to find a fast way to travel to your mouth and now there is this special cookie jar that can help with that. This cookie jar is shaped like the space ship of Buzz Lightyear from the Toy Story movies. And that space ship goes no where without Buzz so he is standing in front of it protecting the cookies inside. This cookie jar is made by Westland Giftware and that means you get a quality cookie jar that can survive generations of cookie eaters. Just imagine having this 10″ tall ceramic cookie jar in your kitchen, it would be so hard to keep your hands off. 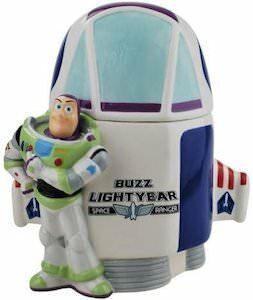 Any time is cookie time so come get a cookie from this Toy Story Buzz Lightyear Cookie Jar. Are you a Betty Boop fan with a birthday coming up? If you are then this is the glass to be drinking out of. This is a Betty Boop wine glass but not just a normal wine glass, it’s a Happy Birthday wine glass. This wine glass is 9 inch and can hold up to 15 ounce of wine and on the glass you can find amazon graphics. Yes that is Betty Boop together with the words “Happy Birthday” and balloons all painted on this glass. Beside great to drink out of this wine glass is a great addition to a Betty Boop collection. Kermit has been a part of peoples lives for a very long time. The early version of Kermit stared on TV in 1955 on Sam and Friends. Then he continued on over the years staring on a lot of shows. He became a real frog in 1971 in The Frog Prince. Kermit had became most famous on the show Sesame Street and then even more famous in The Muppets show. If you love Kermit the Frog and cookies. He will protect your cookies inside this Kermit shaped cookie jar. 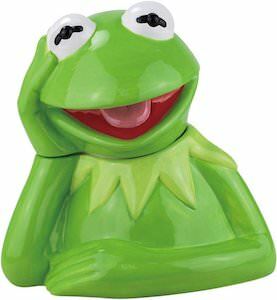 This cookie jar is in the shape of Kermit in a sigh pose. It is also 10 1/4 inches tall in size. Lots of room for you most favorite cookies. Grab you cookies out of this fun Kermit The Frog Cookie Jar. We all love cookies but do you dare eating them out of a cookie jar that looks like a monster? OK the cookie jar looks like Sulley from Monsters Inc. so yes I would dare to take a cookie. 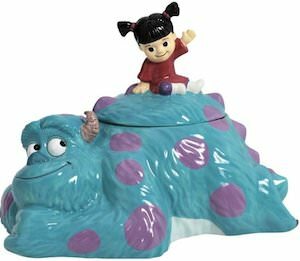 The cookie Jar is shaped like Sulley with his fun color and purple spots and on his back you can see Boo and she is actually the handle of the lid of the cookie jar. This is a ceramic cookie jar made by Westland Giftware witch is known for their amazing cookie jars. If you are looking for the perfect cookie jar then you have to check out this Monsters Inc. Sulley And Boo Cookie Jar.